Select the text and then click Italic in the menu that appears. Or - even quicker - press Ctrl+I. The Italic command works like a switch. 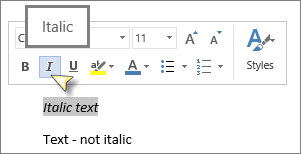 To switch slanted text back to normal, select it and click Italic (or press Ctrl+I).